The 2018 RV-Dreams Spring Educational Rally ended Sunday morning. After everyone left, we had to clean up and get the conference center back to the way we found it. And we had to pack up all our rally supplies. Linda & Kelly boxed up stuff and got it all ready to go while I took care of the A/V equipment. The difference this time was the boxes weren't going to be packed in our rig. We now have no room. So, I transferred it all to the small storage unit we rented about a mile or so from the RV park. I had to drag the stuff out of it and re-pack it. It's hard to believe all of this was in our fifth wheel and truck. The right side and a little bit on the left side was all in the trailer. All the cardboard boxes is rally supplies. Most of the left side and the center was in the truck. 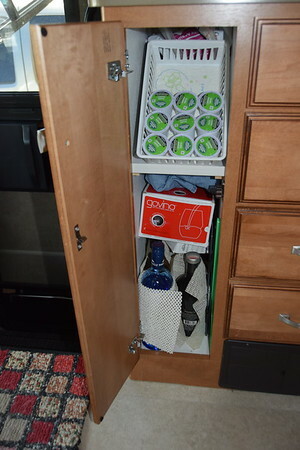 Linda packed some of our office supplies in the motorhome. Once we got everything put away, it was time to relax. Now, I'm not generally a pool guy, but today we headed to the pool with our LaFuma loungers, and we enjoyed the sunshine and the sound of the waterfall. We ordered lunch and pina coladas from the grill, and Bill & Kelly later joined us. The other three may have had a couple of margaritas as the afternoon went on. Mostly we just chatted, read, and lounged with an occasional dip in the pool and visit to the adult-only hot tub. 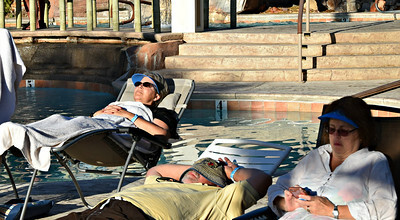 As it got to early evening, poolside naps were in order. We were out there taking it easy for about five hours, probably the longest I've ever sat by a pool without leaving. Well, we had another fantastic Rally and, with about 90 people, it was a good size. The facilities at Nevada Treasure are pretty nice. The pool area is certainly lovely, and the conference center suited our purpose very well. From 3:00 to 5:00 we had check-in, and our volunteers did a wonderful job, as usual. We also got to meet, for the first time, Terry & Jo, who drove over from southern Utah. 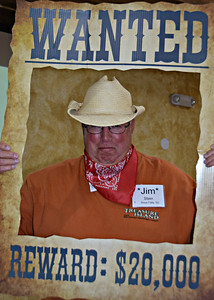 You will see Terry & Jo on our Forum, and Terry served as our moderator for a few years. He still helps me quite a bit in identifying spammers and those that aren't adhering to our posted policies. 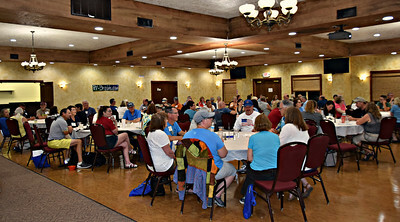 It's hard to believe we had never met, and we didn't get to spend a lot of time, but they were able to stay for dinner and get to know many of the attendees. and kicked things off with our opening song "Me & My Gang" from Rascal Flatts. 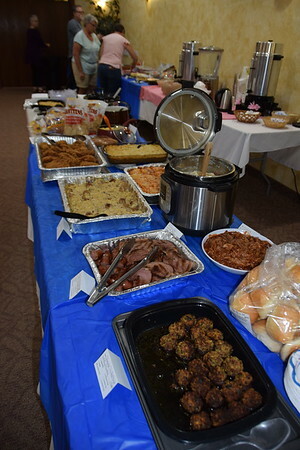 The catered BBQ dinner was quite good, and we were off to a good start. 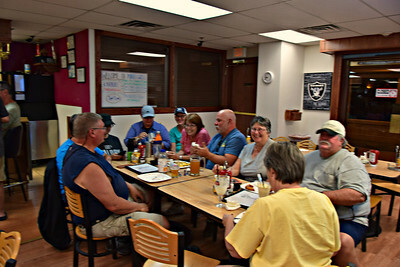 After dinner, we did some introductions including Bill & Kelly (Bill & Kelly's American Odyssey & RV Solar Solutions) and Glyn Carson and Ken Shockley from RV Driving School. Then we went over the agenda for the week. 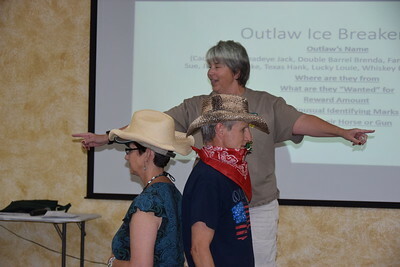 Next was Linda's "Outlaw Icebreaker" going with our "Old West" theme (not that this group really needed an icebreaker). 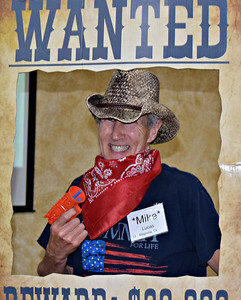 We re-assigned tables so everyone could get to know a different small group of people, and each table selected their Outlaw to represent them in a playful shootout. 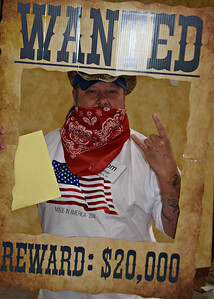 Of course, we got their photos with a "Wanted" poster. 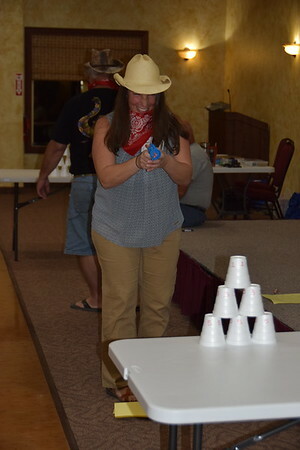 Linda had pairs participate in a modified duel - back-to-back, three paces, .... and then shoot a foam ball at cups which were marked with points. 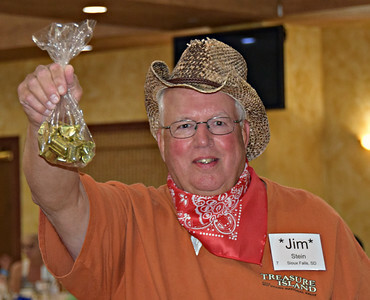 One by one, outlaws were eliminated, and Jim took home the bag of gold .... chocolates. We had a lot of laughs and the icebreaker did its job. We left around 8:30 and prepared for the first day of seminars. 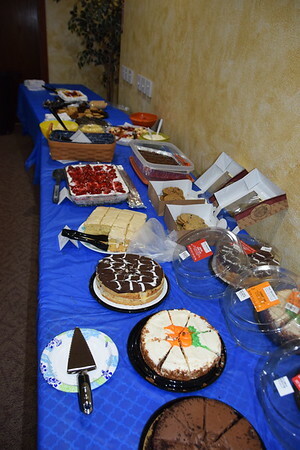 Daily, the doors opened at 8:00 for coffee and tea, and we started seminars promptly at 9:00. 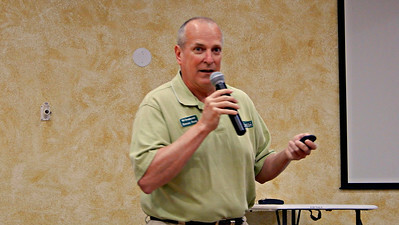 We cover a lot of information, and we try very hard to stay on schedule and get everyone's questions answered. 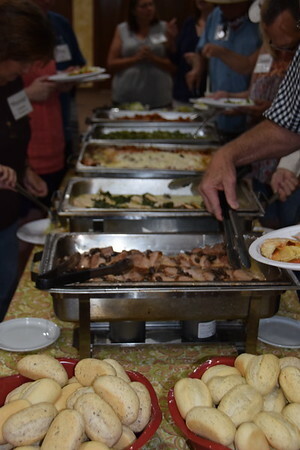 We had a morning session and an afternoon session on Tuesday, and then we had a break before returning for our catered Italian dinner. 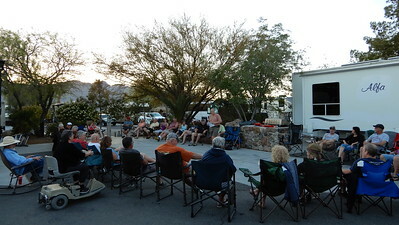 It was also our "Gadget Night" which is RVer "show 'n' tell" where folks present various items they have that make their RVing life easier, more organized, and/or more enjoyable. Many tips and tricks were offered with the follow-up questions of What's the name? Where did you get it? and How much? 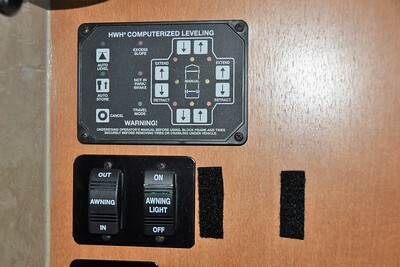 We have several of the displayed gadgets in our rig already, and later that night we ordered a few more that will help us with space savings and weight in our new rig. After "show 'n' tell", we gave out door prizes. We were given several copies of "The Wright Guide to Camping with the Corps of Engineers, 11th Edition". The c0ver photo is one I took several years ago. That's our Cambridge (before it was painted) sitting in a wonderful campsite in a Corps of Engineers campground. Since they used our photos on the front and back covers, they gave us several complimentary copies that we offered as door prizes. Our RV-Dreams logo is on the back. In addition, RV Driving School provided some nice door prizes, and Glyn Carson, their instructor in attendance added a couple as well. 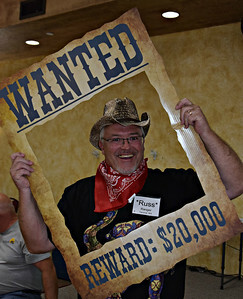 We also got a free membership to Harvest Hosts - they help us out at every rally. And, our friends at RVs For Less chipped in some items as well as our Grand Prize - they reimburse a Rally registration for one lucky couple. 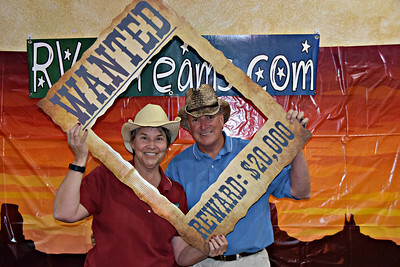 Rich & Cindy were our big winners. With that, we called it a night. Today was more seminars starting at 9:00. And each day, between the morning and afternoon sessions, we stayed at the conference center and had lunch with whoever wanted to join us. 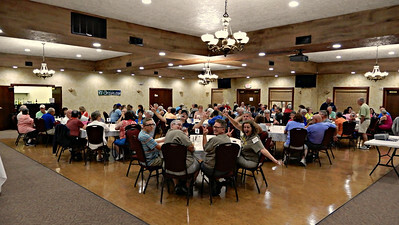 We had between 20 and 30 people staying in hotels and various other off-site accommodations, so it gave them a place to have lunch without having to go back to their rooms. 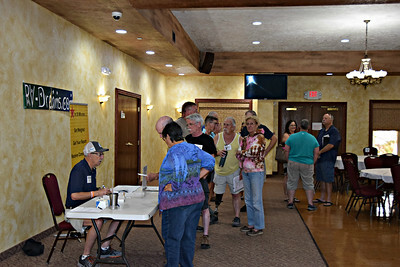 Also, Steve Kass from RV Weigh joined us and he signed up folks to get weighed after our last seminar of the day. 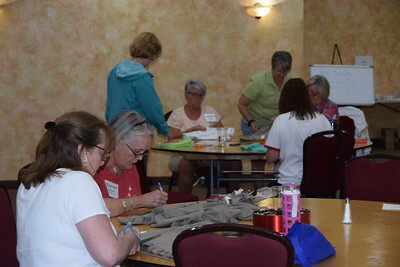 And Linda did reprised the T-shirt braiding instruction that she offered on check-in day, Monday. The rest of the night was free for everyone. 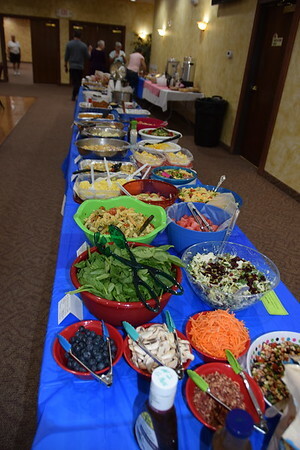 Today was more seminars followed by one of the most amazing potlucks we've seen. 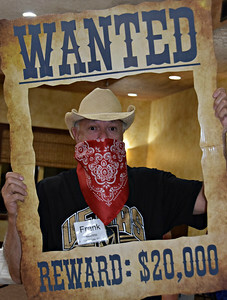 After dinner, we had some fun with our RVing take on the Newlywed Game - "Road Tested". 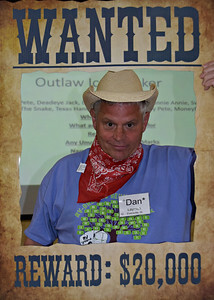 Thanks to all of our participants for being great sports and helping to provide an evening of laughter and camaraderie. We had a morning of seminars on Basic RV Maintenance, and then Linda & I demonstrated our two Sea Eagle Inflatable kayaks - the SE 370 and the FastTrack 385. And we sent out links to InflatableBoats4Less.com. In our busy winter, we neglected to mention that our friends Tim & Crystal with InflatableBoats4Less sold the business to a young couple - Chalease & Curtis Linderman. We've been in contact with them, but we haven't yet met. I'm sure they will provide the ongoing service that Tim & Crystal have all these years. For those that are interested in those two boats, we did set-up and pack-up videos a couple years ago. The rest of the day was free for everyone. We took the opportunity to have Steve weigh our motorhome. We were a little heavy on the passenger side rear axle, but we were 1,250 pounds under our GVWR. So, with a little shifting of weight we'll be fine. Good news. We had more seminars Saturday morning, and then we had our very popular Open Rig Walk-throughs where several attendees volunteer to open up their rigs to let others see what they look like "lived in". It's also an opportunity to see modifications, upgrades, and storage tips. 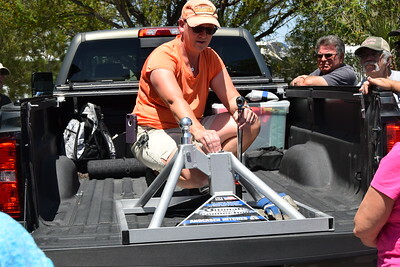 Christine & Angie showed those that were interested their Anderson Ultimate 5th Wheel Connection hitch. I hadn't seen one in person, so it was nice to see. 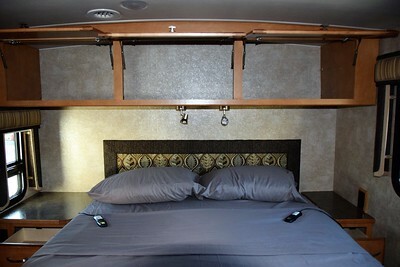 It's basically a better way, in my opinion, to use a ball-type gooseneck hitch for a fifth wheel. After seeing it, I'm still partial to a traditional fifth wheel hitch, but it's a great solution for the right situations. 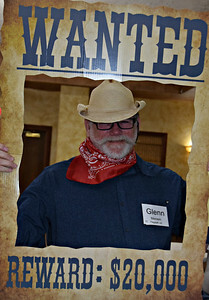 Saturday night, we continued with our "Old West" theme. 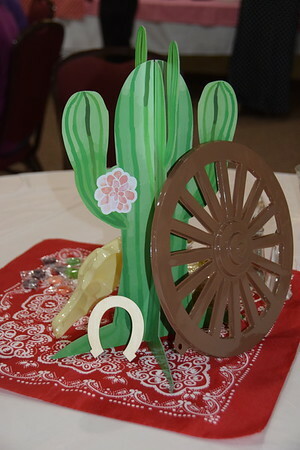 Linda and Kelly decorated the conference center. 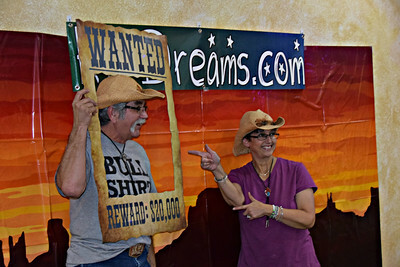 Several, including us, had their picture taken with the backdrop the ladies put up. 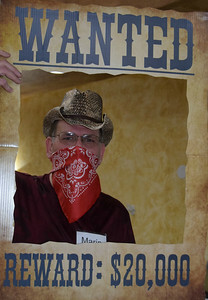 We had a few that dressed up for the final evening dinner and party. 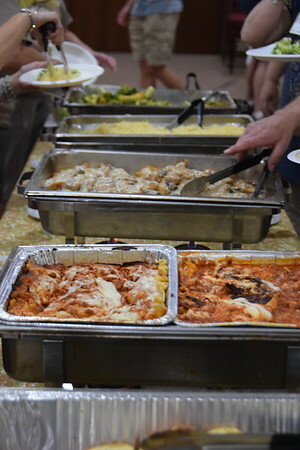 Soon, we were digging into our last catered meal. 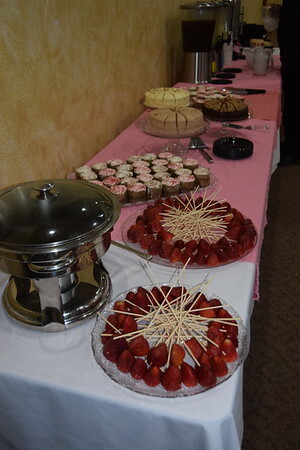 I have to say the dessert table was the star on this night. After dinner, our DJs had us on the dance floor. But after a long week, we were all done by about 8:30. We called it an early night. This morning we had our traditional farewell breakfast. Several left today and got their rigs weighed on the way out. Others were staying for another day or two. But we said our final word of thanks and the 2018 RV-Dreams Spring Educational Rally was over. There were lots of smiles and a few tears, and we look forward to seeing everyone again down the road. We wished everyone safe travels and we hope they departed with much more knowledge than they came with and, hopefully, several new friends. 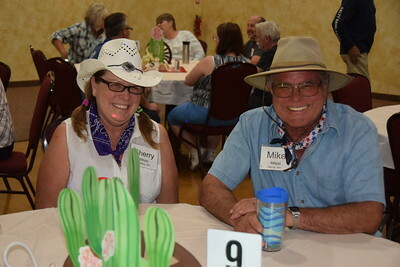 Thanks to the staff at Nevada Treasure, our attendees, our special guests, Kelly & Bill, and all our volunteer helpers, another successful RV-Dreams Rally is in the books. Well, our Spring Rally is going great. We're quite busy and pretty exhausted at the end of each day, but we have another fantastic group of people. I've got lots of photos that I'll get uploaded and posted eventually. But, I really just wanted to give you an update while we had a little time. A few days ago, I placed an order through Amazon for a Blue Ox tow bar with safety cables and an electrical cord to go from the motorhome to our new-to-us 4WD Jeep. 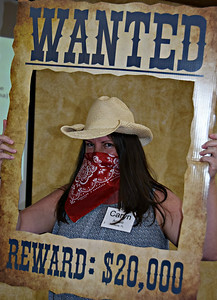 Not ten minutes later Kelly brough Chris, one of our attendees, by. 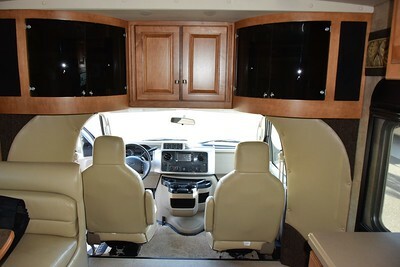 Christine & Angie just recently bought a fifth wheel and got rid of their motorhome. It turns out they had a Blue Ox Alpha tow bar - the exact one I wanted, and she was selling it at quite a discount. It has 10,000-lb safety cables and the electrical cord that fits our Class C and Jeep along with some locking pins. And she also had the Kargard II towed vehicle protector. So, we made a deal and I bought both. And I quickly cancelled the Amazon order before it shipped. Things keep falling into place. Today, Friday we had a couple hours of time, so I disconnected the utilities and Linda got the inside ready to go. 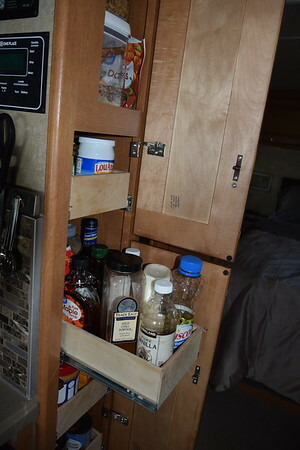 She pulled the knives off the magnetic strip and put them in a drawer and stowed the magnetic spice containers in a more secure spot before she brought in the slides. I pulled the motorhome out into the front parking lot, and we hooked up the Jeep after I watched a few videos on etrailer.com. Hooking up the Jeep was pretty easy - not as easy as hitching the fifth wheel, but not too bad. Remember, the Jeep came with the Blue Ox baseplate on it, so it was ready to go. The protective screen adds another step, but that was okay as well. Once I got the screen in place, I had to tighten it down, so that took some extra time, but it's a one-time thing. I won't have to do that again. Linda then followed the instructions in the Jeep's manual on how to set it up for towing. It has step-by-step instructions which ultimately included putting the 4WD into "Neutral" (the transfer case) and the automatic transmission into "Park". Yes, it goes into "Park". Those steps are also easy and will become second nature. 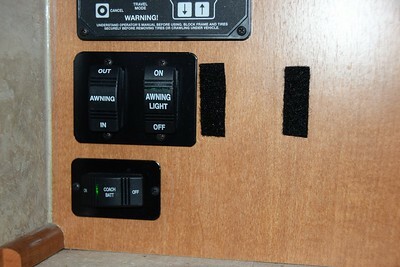 The braking system that came with the Jeep, the Roadmaster Invisibrake, is basically "plug 'n' play". 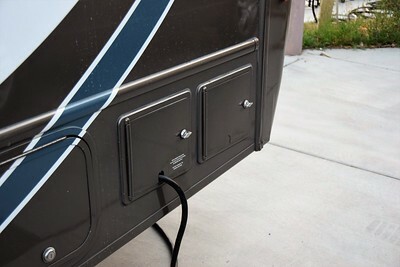 We didn't have to do anything other than plug the cord into the seven-way outlet on the motorhome and to the six-pin outlet on the front of the Jeep. We tested the brakes and the lights just like we normally would with the fifth wheel, and everything just worked. I towed the Jeep around the parking lot and watched how the Jeep tracks behind the motorhome. I made very wide turns, and I learned I didn't need to swing out quite that wide. So, there we are. We successfully hitched up a toad to a motorhome for the first time. 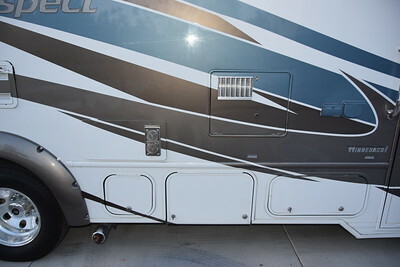 For anyone that says it's just as easy as hitching and unhitching a fifth wheel, it's not. But our set-up is fairly easy and we'll get quicker as we gain experience. 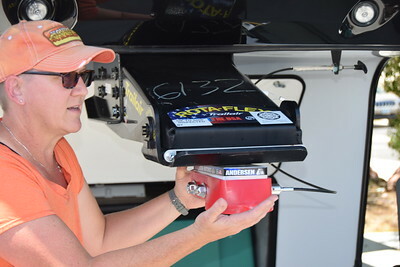 While we were out of our site, Steve with RV Weigh, weighed us. Amazingly, we are NOT overloaded. We are 1,250 pounds under our Gross Vehicle Weight Rating (GVWR). Whew! However, we are heavy on our passenger side end of the rear axle, so we're going to have to shift some weight to the driver's side. 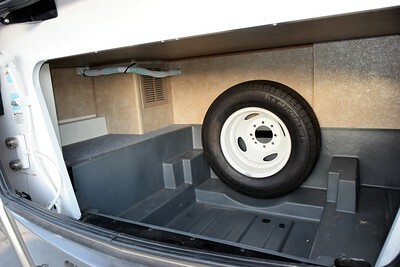 I'll have to re-configure the "trunk", and we'll probably go through and eliminate more hanging clothes which are in the closet in the slideout right over the rear tires. But we're quite pleased. We don't really have room for anything else, so we won't be adding anything other than the new solar system and batteries that'll be installed in the next week. Even with that weight, we should still be okay. That's very good news. Well, that's all I have time for right now. Until next time. 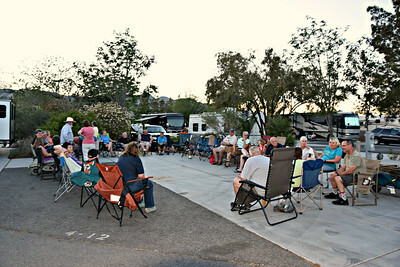 We had our first official pre-rally gathering Saturday evening. 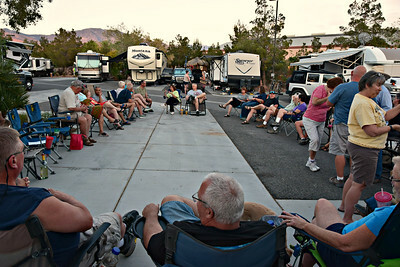 Nevada Treasure doesn't have a big community firepit or outdoor gathering area, so they just gave us an empty RV site. It had no shade, so we waited until the sun was low in the sky before we got together. We had about 40 people. About dark, Linda & I displayed our skill of remembering everyone's names. It's something we've been doing at our pre-rally gatherings for years, and now it's almost expected. 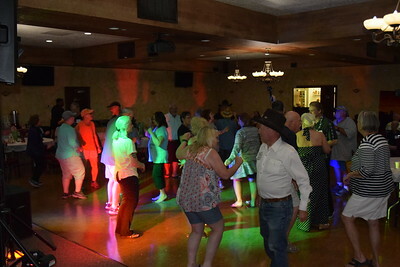 After spending some time getting to know each other, a few of us went into the grill here at the RV resort for some beverages, snacks, and Saturday night karaoke. 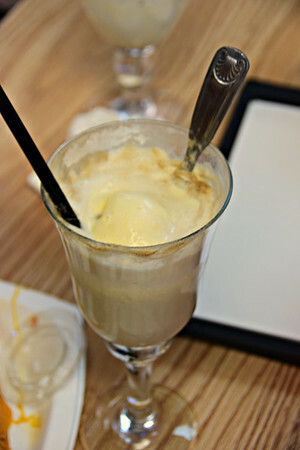 Linda & I had "Adult Root Beer Floats" which were root beer floats with vanilla ice cream and vanilla vodka. Now, Kelly & Bill (Bill & Kelly's American Odyssey) have been here about a week. Bill is doing a couple of solar installations and Kelly is Linda's "rally assistant" for the upcoming week. 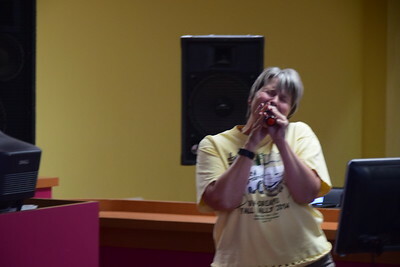 Kelly also loves to sing, and she instigated the karaoke for the night. In fact, against my nature, she got me up to sing with her. We were the first from our group and we sang "American Pie" so that the rest of the bar and grill would join in. 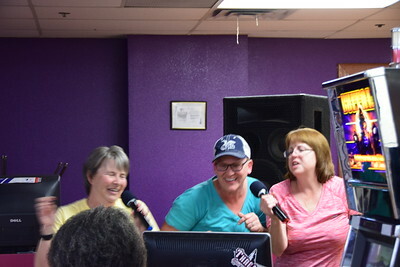 and Christine joined Linda and Kelly for another tune. 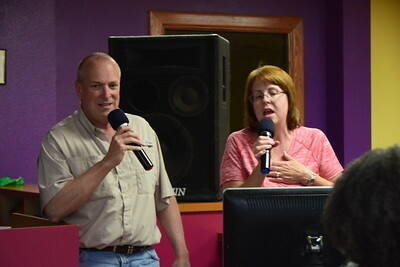 And Steve & Denise closed out the night with a Johnny Cash/June Carter. For the record, Steve & Denise came in this evening and their site was the one right next to where we were gathering. 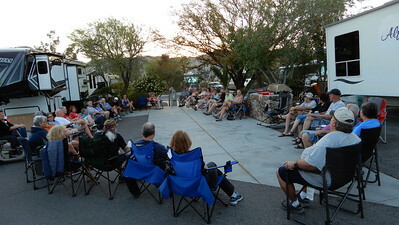 So, there was quite an audience watching Steve back in their fifth wheel. He did a great job, and they didn't even set up - they just grabbed chairs and joined us. I think this crew is going to get along just fine. On Sunday, we continued our preparations for the Rally, and we once again got the early arrivals together in the evening. But it was in a different site. 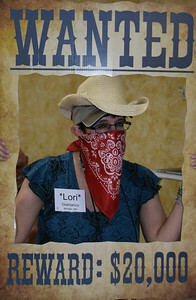 Thanks to Lori for these photos. 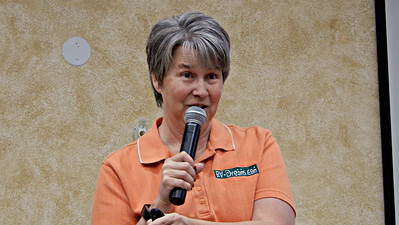 We had several more names to memorize, and Linda did her usual "night before the Rally" request for volunteers to help with check-in. We're ready to go, and we're looking forward to getting started tomorrow. 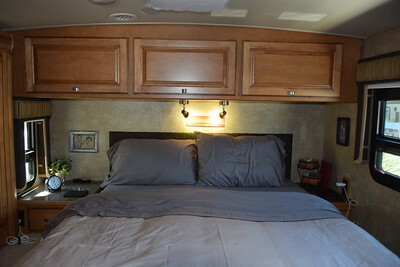 So, we had our first night living in the motorhome with full hook-ups and everything put away. I think we're going to be okay. The tiny bathroom and shower are a challenge that we'll have to get used to, but this is doable. Everything definitely has to go back in its place after use, and there are things that have to be moved out of the way to get to other items and spaces, and then the original item has to be put back. There will be a learning curve, but our penchant for organization and our aversion to clutter will serve us well. So, here are some photos of our rig now that we've moved in. Notice the new, high-neck faucet Steve installed the other day. Can't believe the prior owners didn't do that - it makes a huge difference. Linda couldn't part with our countertop ice maker, so it sits on the counter when it's making ice, and then it goes to the corner with the Instant Pot when not in use. Both of them will probably ride in the Jeep when traveling. 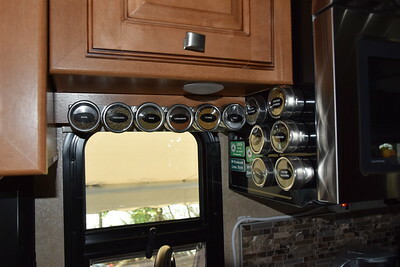 The microwave/convection metal, so it has become the holder for many of Linda's new magnetic spice holders. She also hung a couple of magnetic bars for more spices and a few knives. I'm just hoping all that stays in place when we move down the road. Guess we'll find out. She replaced her Keurig with a Keurig K-Mini. There isn't an outlet on that side of the galley, so she improvised. It's not "code" but don't tell anybody. She got a small rack for the empty space beside the door. Our calendar and key rack is on the end of the kitchen cabinets. Command hooks are getting lots of use. 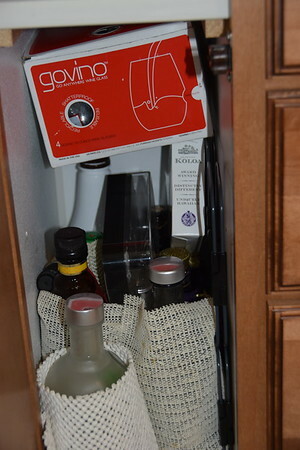 She improvised a Keurig K-cup display on the top shelf of her liquor cabinet. If you recall, the water heater is under the sink taking up valuable real estate, but she has worked around that with an office organizer for her aluminum foil, wax paper, etc. And the various ziploc baggies fit in there as well. By the way, the can of Raid isn't for bugs; its hornet & wasp spray to be used in self-defense if necessary. She's got various containers to make the pantry work. I don't know where anything is yet, but I'll get there. 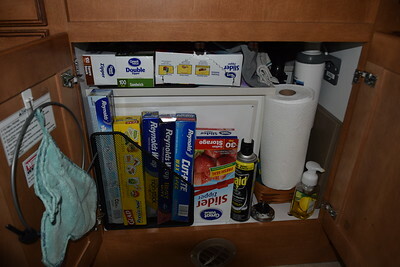 And her removal of the the piece of wood separating the upper and lower pantry cabinets, increased the usefulness of one drawer. We got a small garbage can that works in the kitchen, and the dinette is currently serving as our office. By the end of May, we should have the dinette replaced with recliners/theater seating. Notice she was able to hang her Cardinal painting. Without a frame, it's narrow enough that the slide misses it when it comes in. 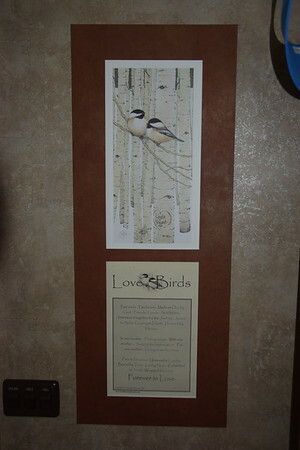 And on the other side, she was able to hang the colored pencil drawing her Mom made using one of my photos. Office supplies are in the cabinet where a satellite DVR would go. It will be interesting going without satellite TV, but I'm looking forward to the challenge. I'm also looking forward to getting rid of that hefty monthly payment and our love/hate relationship with DirecTV. With our data package, we should be able to stream a few of our favorite shows and sports events, but we will eliminate the tendency to watch mindlessly. 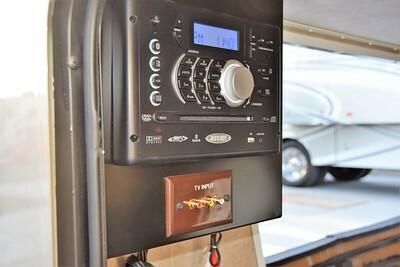 The motorhome is equipped with a Sirius XM satellite radio, so we did sign up for their Mostly Music Package. 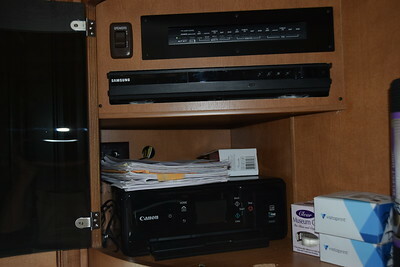 The opposite cabinet has our new Canon PIXMA 6120 which fits in nicely. We'll put the big printer in storage as soon as the Rally is over. 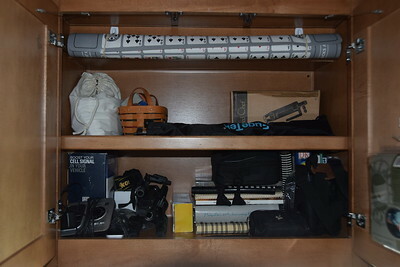 The center cabinet has a couple games, photo equipment, binoculars, and a few of our bird and wildlife guides. 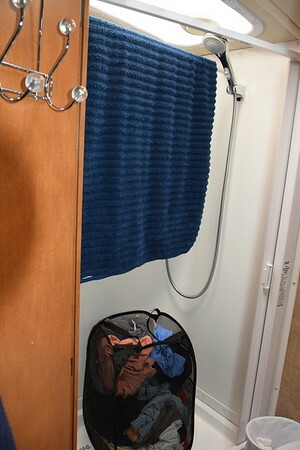 Moving on to the bathroom, we took the suggestion of a couple of folks and got a collapsible laundry hamper that just stays in the shower. It's one of those things that we move back and forth when necessary. There is a rod in the shower that we use to dry towels, but it is removable and we have to take it out to shower. If I were two inches taller, I wouldn't be able to stand under the shower head, and if I were any wider, I wouldn't fit in the shower at all. So there's an incentive to keep the weight under control. The shower is one of the biggest adjustments for me, but I'll get used to it. However, I will likely be visiting the campground showers more often. 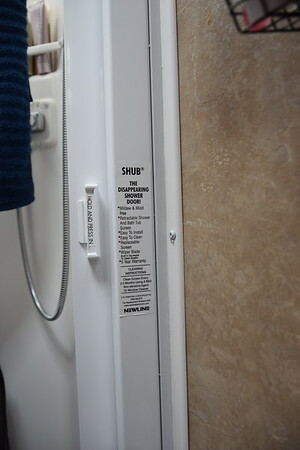 Now, I do like the shower head, and I prefer the SHUB retractable door over a shower curtain. 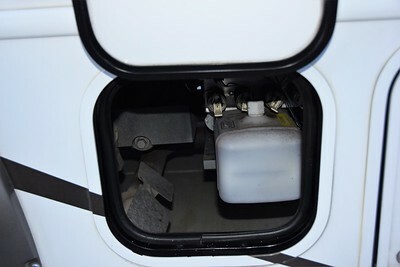 It saves on already limited space, and it has an integrated wiper blade in the housing that squeegees it every time the door is released back into the open position. They say to wipe it down with a non-abrasive cleaner once every two months. Linda removed a hand towel holder that was on the left of the mirror and re-mounted it in the unused curved space on the right of the mirror. It's actually more convenient there and it freed up some space for another basket in the space where it used to be. She managed to squeeze a trash can, toilet paper holder, bowl brush, and wet wipes in the area around the toilet. Now, the toilet sits up on a ledge. And though this is a bit personal, when we sit on the toilet, our feet barely touch the floor. 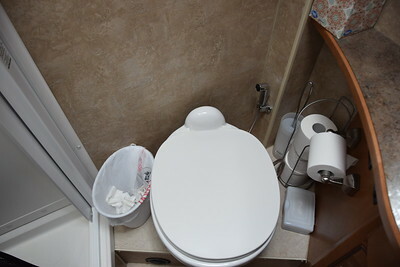 While the rest of the motorhome is built for short people, the toilet is better for someone with longer legs. I apologize for being overly descriptive, but while the elevated toilet is easier to sit on and get off of, doing our business comfortably requires either a stool for our feet or tucking our feet back and resting them on the ledge. Again, I'm sorry. In the bedroom, Linda got a duvet set on Amazon, and she eliminated the 43 decorative pillows we had in the fifth wheel. Whereas, making and unmaking the bed in the Cambridge was a whole production, and I couldn't "unmake" the bed properly, she is less obsessive now. I help her make the bed each morning and it takes us about 30 seconds. 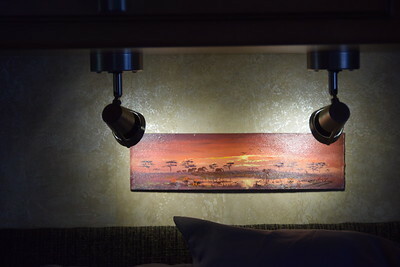 She hung some photos on either side of the bed over the nightstands and she put up our hand-painted souvenir from Africa. With the reading lights directed, it looks like a proper art display. 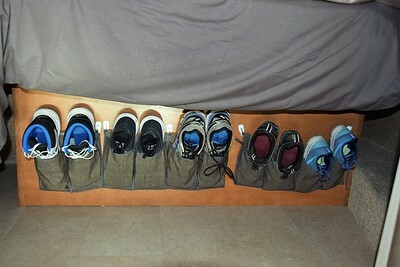 Linda also bought this 24-pocket shoe organizer through Amazon. She cut it in half and hung one section on the wall below the bedroom TV. Then, she cut the other half into pairs of pockets and hung them on the foot of the bed. With the duvet on, you don't even know they are there. She's made our new home into a livable, workable space. And I'll leave you with one more thing. This artwork was also in our fifth wheel. We took it out of the frame, and she mounted it on the empty wall at the foot of the bed on my side. Two Souls. Two Hearts. Made as One by God. Joined in Spirit. Growing in Depth. In one another ... Finding delight. With one another ... Seeking the highest good. For one another ... Laying down their lives. Pure in Devotion. Unmoved in Loyalty. Bound by Trust. Led by Hope. Committed to Truth. Wrapped in Grace. The days have sorta run together this past week. 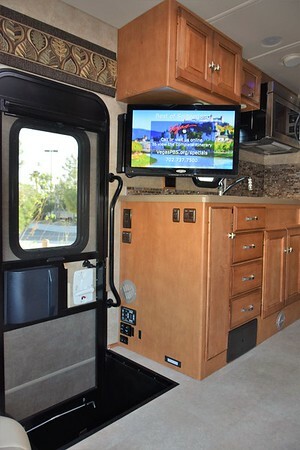 We just continued our transition from the fifth wheel to the motorhome, and mixed in some social time along the way. Each day, we had a break away from all the walking back and forth and runs to the storage unit. That helped split up the constant moving of stuff and decision-making. On Monday, I hung Linda's Swiffer and a couple other items from the ceiling in the trunk. The trunk has gotten pretty full, but it's mostly lighter weight items that may be a little bulky. Linda displayed her handyman ingenuity in a couple of modifications. so that she could get her wine bottles in and turn it into her tiny liquor cabinet. 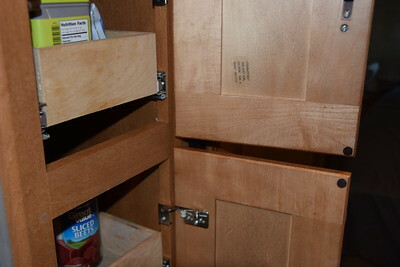 And she removed a wood piece between the upper and lower pantry cabinets to create space to place her taller bottles in one of the pull-out drawers. 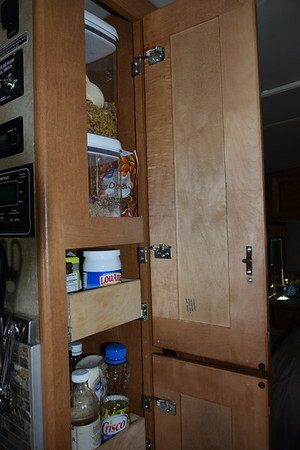 Now that top drawer in the lower pantry cabinet will hold her cooking oil and other taller bottles. Those little modifications made a big difference and made her quite happy. The rest of the day, we continued to transfer some stuff and eliminate other stuff. There's no place for our 17-foot ladder, and this rig doesn't have an attached ladder, so Linda ordered one of those telescoping ladders. This type of ladder wouldn't be my first choice, but it is light and compact and will suffice for our occasional needs. 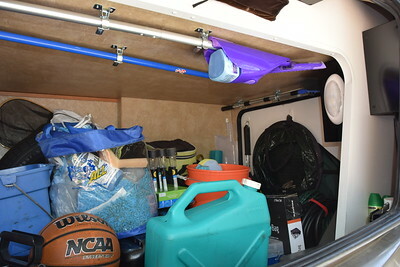 I re-organized the trunk about four times, and then Linda handed me a couple small bins of cleaning supplies that wouldn't fit inside the coach. I found a place for them so they would be easy to get to. We made good progress, and then got cleaned up for dinner. We met Gary & Leesa and David & Dana (Rally alumni from several years back) at The Grill Room at the Mountain Falls Golf Club. It's a place you can get pretty good food consistently, and there is a great view of the mountains. After dinner, we went bowling. We were having a great time, but they closed at 9:00. So we went home and crashed. This morning, we continued our transfer chore. Then, in the afternoon, Deb and her daughter, Katie, came by for lunch. We ordered from the grill here at Nevada Treasure and ate out by the pool. We met Deb at the Columbus RV Show in 2017, and she was out here with Katie on a photo shoot. Katie is a professional photographer (Kathryn Hyslop Photography) back in Pittsburg. They were visiting Death Valley, Red Rock Canyon, and Valley of Fire State Park, so Deb contacted us about getting together. They graciously came to us after their morning visit to Death Valley. We had a nice lunch and chat and we answered a few questions about full-timing. Deb and here husband are anxious to get started. That was a nice break this afternoon. While Linda was showing Deb and Katie our two RVs, I took some photos of hummingbirds. They are everywhere in this park. After saying goodbye to Deb and Katie, we continued our transition. Eventually, we messed with the bed. The prior owners had a two-inch foam topper that we took off. 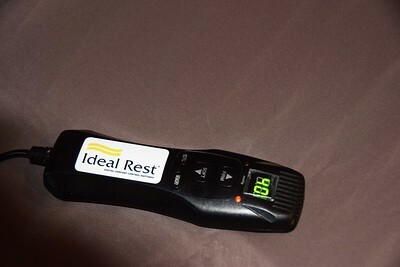 We wanted to try the Ideal Rest air-adjustable bed without it for a couple of nights. The instructions are fairly straight-forward, but the bed didn't seem to cooperate. Later, Bill & Kelly came by. Bill (RV Solar Solutions) is going to install our new solar system after the Rally, so we went over what we wanted and what would fit. Our space is certainly limited, but we can get three solar panels on the roof, and we have space for four batteries. 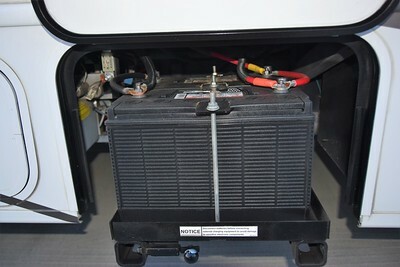 We're getting four Lifeline 6-volt AGM batteries with total capacity of 440 amp hours, and the three panels should give us between 510 and 540 watts depending on which panels are available. So, we'll have less battery capacity but more solar than we had before. 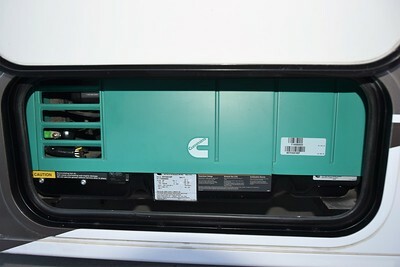 We're also going with a 2000-watt Xantrex inverter/charger, a step down from out 3000-watt inverter, but a big step up from the limited 1,000-watt inverter that came with the Aspect. Of course, our power requirements will be less in this rig. 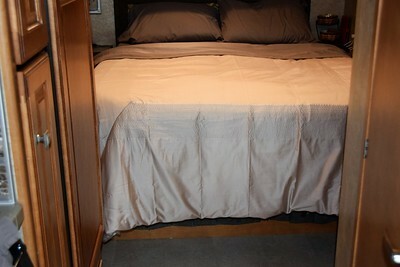 In the evening, we officially moved into the motorhome. I took my first shower in the Class C, and that wasn't a pleasant experience. It's a good thing I'm not any bigger than I am. 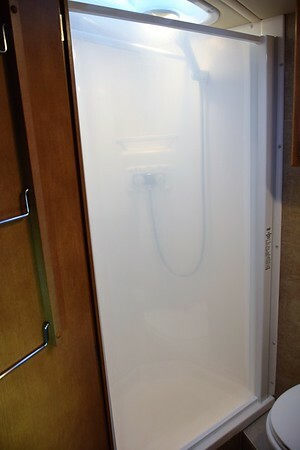 It wasn't horrible, and I'll get used to it, but it's a far cry from what now seems like a luxury shower in the fifth wheel. We called it an early night. After waking up in a trench, we determined that the air controls on the bed were switched, and Linda's efforts to soften her side, put me in a hole. We're going to try the bed another night to see if we want to put the topper back on, but I've already decided that it won't be around long. This morning, Linda and Leesa went into Vegas to get their nails done and have lunch while Gary and I played golf. It was a beautiful day. The gals had fun and Gary and I enjoyed playing with a couple from Alaska. I had a pretty good round, but Gary showed off with a one-over 73. He's good .... and humble, and I really like playing with him. Unfortunately, the pace of play was extremely slow and it took us nearly five and a half hours. When I got back, many of the space savers that Linda ordered arrived, so she felt like she could make some progress on items she had been waiting to stow. Most of the day was gone, but we scrambled to do a little bit before walking over to have dinner with some of the couples already here for the Rally. Linda, of Steve & Linda, made chili and cornbread and I devoured a couple bowls as we chatted with our hosts, and Jim & Glenda and Bill & Kelly. We relaxed for a while, but then departed to get a little more work in before bedtime. Before calling it a night, we re-adjusted the bed to see if that would help tonight. It helped a little. We had most everything transferred by now, but Linda's knees were killing her from going up and down two sets of steps for the last few days. 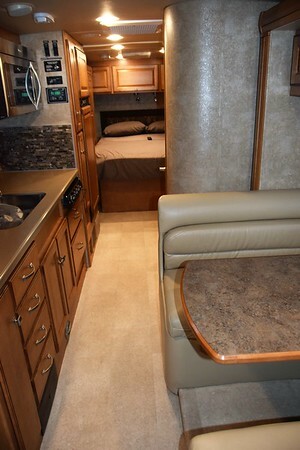 She stayed in the motorhome, while I boxed up the last remaining items in the fifth wheel for her to go through. 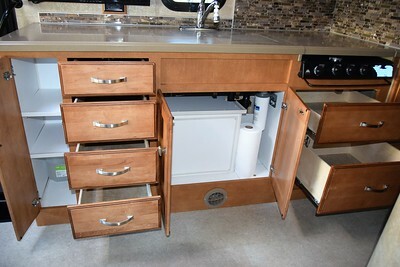 I emptied the HUGE cabinet over the fifth wheel sink, and delivered an almost full storage bin to Linda. She found paring that down to be one of the overwhelming tasks for the day. She put a lot in the trash and some in a Goodwill bag, and the rest she was going to try to find a spot. She also went through the box of stuff that I removed from the dining table chairs. 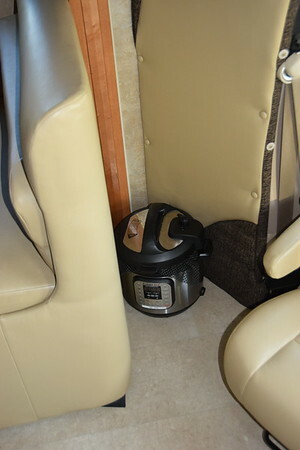 Yep, even the chairs in the fifth wheel had storage and that's where we kept things like batteries, fuses, extension cords, and other "just in case" items. I made sure every cabinet and drawer in the fifth wheel were emptied, and I made another run to Goodwill and the storage unit. With everything out of the Cambridge, we breathed a sigh of relief and it finally seemed the monumental task was almost complete. Linda had purchased a replacement faucet for the kitchen sink, and Steve agreed to install it for her. So, he got that done and it made a huge difference. With that going on, we got a call from Vernon Lambright of Lambright Comfort Chairs. We contacted him about replacing the dinette in the Aspect, and we've been working on a plan. But he really, really wants us to go back to Indiana so they can install it. Finally, he made us an offer we couldn't refuse, so it looks like we're going to make a long, fast roadtrip at the end of May before we make the trek back to begin our travels in the northwest this summer. It really messes with our travel plans, but we're excited for the new theater seating with lots of bells and whistles, and it's really hard to say no to Vernon. He's one of the nicest people we've ever met, and he's taken really good care of us. Plus, he honors a little coupon we offer to our readers when they buy direct from him (you have to print it out). Click on the one below to get a larger version. We're looking forward to getting the new furniture and sharing the details down the road. I took the truck to the storage unit and removed our Sea Eagle Foldcat and all its accessories. We think we're going to give it to Linda's sister so they can use it on their small lake. Yikes, the storage unit is full. I should have taken a picture of that. I also donated our bikes and bike rack to the local bike shop so he could clean them up a little and give them to someone that needs them more than we do. We certainly liked having our bikes when we were in the right places to use them, but for the little use we were getting out of them, they were becoming more of a pain than they were worth. There will be times we will miss them, but at this moment, I'm pretty relieved to not have to deal with them. I went to the office to let them know we were ready to put the fifth wheel in storage and move the motorhome into the fifth wheel's spot. But the person that handles the storage area was out sick, and we'd have to wait until the next day. In the evening, we walked over to Kelly & Bill's site where Bill made us cocktails and Kelly fed us a delicious pot roast she made in her Instant Pot. We had a very nice time getting to know them better as the skies darkened and it got cold outside. With an early morning road-trip planned, we headed back to the motorhome before it got too late. Okay, so, in the midst of all the chaos, I've been searching for a 4WD Jeep Liberty to tow behind the Winnebago. The Liberty model years 2002 - 2007 made towing four wheels down very easy, and we really like the body style and the short wheelbase. And they are capable off-road vehicles as well. We considered other options as well, but I kept coming back to the Liberty. We had a 2003 (tree fell on it), a 2005 (230,000 miles), and our current 2WD model. I found a 2003 Jeep Liberty Limited in southern California that looked great, has 4WD, AND is already set up for towing. 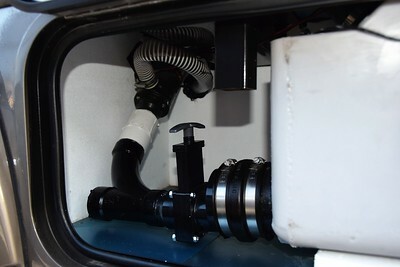 It includes a Blue Ox baseplate, and a Roadmaster InvisiBrake Supplemental Braking System, both of which are installed and ready to go. After texting and talking to the seller a couple of times, I was convinced it was a great deal and worth the four-hour drive to check it out. So, we got up at 5:00 a.m. and were on the road by 5:45 and headed to Norco, CA off of I-15 east of Los Angeles. While Linda drove, I researched insurance options and made phone calls about getting it registered in Florida under our new mail forwarding address. Here's what the county clerk told me. 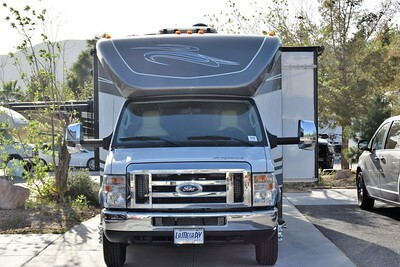 As a full-time RVer, we have to register the RV in Florida before we can get a Florida driver's license. 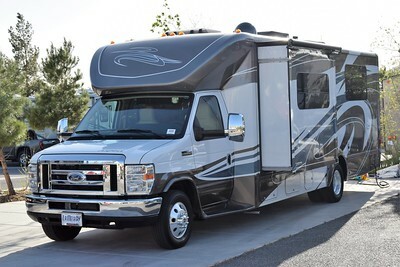 We can register the motorhome by mail, but it will take us a month and a half to get the title, so we can't do it until all the paperwork from our recent purchase is complete. So, my thought was we would register the Jeep instead 'cause I could get the title right away, and then we could get our Florida driver's licenses (we have to do that in person, so it would require a flight). But, no. They said we can't register another vehicle other than the RV before we get driver's licenses. Sheesh. If we bought the Jeep today, we'd have to register it in Kentucky. That actually makes it easier, but it would require us to have to change it to Florida later. But it takes 6 - 8 weeks to get the Kentucky title. Anyway, I called Kentucky and they told me what I needed to register it by mail. I also researched what was required on the California side to make sure we did that part correctly. That side was surprisingly easy. As we got closer to Los Angeles the psycho southern Cal drivers showed up weaving in and out of traffic and missing our bumper by inches a few times. Linda was in too much shock to lean on the horn, not that it would have done any good, but it would have made me feel better. Finally, we arrived. Craig is a mechanic that builds Jeeps as a hobby. He purchased the used Liberty a few years ago and replaced the shocks, struts, and several other parts. He had it set up to tow behind his Seneca Super C motorhome. But he prefers to have his Wrangler with him when he goes out, so the Jeep has been used very little and he has had it covered. It's exactly the same color as the 2005. We drove it around, and it drove better than the one we have. It's in fantastic shape for a 2003, and the price was definitely right. He had three other calls on it while we were there. So, we bought it. We completed the paperwork, found a notary which was needed for the Kentucky forms, and we drove dueling Jeeps back to Pahrump. We got back just before 5:00. 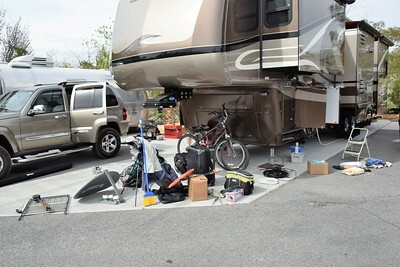 But we couldn't rest, as we had to move the fifth wheel into storage. So, I disconnected utilities while Linda brought in the slides, and we put the truck and trailer in storage. The resort employee, Eddy, was with us to inspect the condition of our rig, and make sure we didn't damage any others. 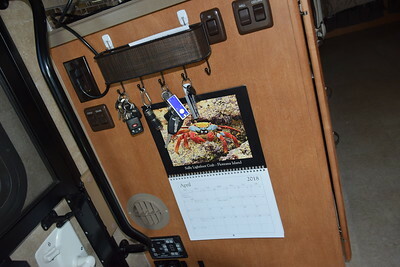 I removed the tire pressure monitoring sensors to put on the motorhome and toad. And we left our baby to wait for its new owners. It took just a few minutes to move the Aspect into our site. Linda hit the automatic leveling, and it did its thing. 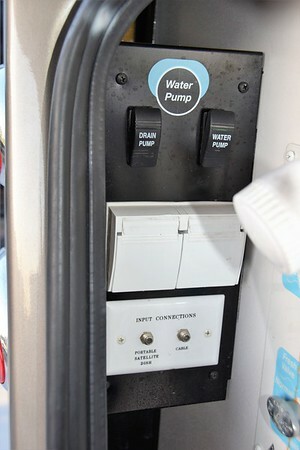 It had been hooked up to electric across the road, but now I was hooking up the water and sewer for the first time. That went well. Set up was extremely easy. Our gray tank sensor was showing full, so I took the opportunity to dump the gray tank using the funky pump system. It took a little while, but that worked just fine. The rest of the evening, I moved items from the 2005 2WD Jeep to the 2003 4WD Jeep. We walked up to the grill to introduce ourselves to some new arrivals, but we didn't stay long. We were going to bed early tonight, but first I listed our other Jeep on Craigslist for the Las Vegas area. I'll list it on other sites shortly. I'm pretty sure I can sell it in a month. Whew, that was a long, long day. 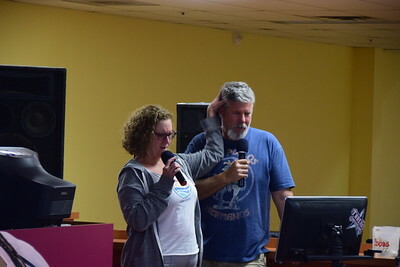 For our recent Reunion Rally, Lee Perkins (Open Road Video) had folks send him photos of their life on the road, and he put this video together to Andy Grammer's "Good To Be Alive". The lyrics fit perfectly. Today, we didn't get a lot accomplished. We took it easy in the morning, and then headed to Las Vegas. Our truck was ready to be picked up at Diesel Specialists. On the way out of town we stopped at the RV Superstore to ask some questions about tow bars, baseplates, and towed car braking systems. What do the various options cost, and what is the cost and timing of installation? Once we got to the service manager and he warmed up to us, he confirmed some of the research I've been doing. There are solutions for every budget, but it looks like top-notch equipment and installation will run about $2,500 - $3,000. I've been looking at the Roadmaster, Blue Ox, and Demco/SMI systems, and like everything else in the RV world, there are lots of opinions. More research to come. A few months ago, I lost the fuel level reading when I switched from our large diesel tank to the small one. I just lived with it, knowing how far I can go on the small tank and keeping mileage records diligently. But, with us selling the truck, I wanted to get it fixed and have the oil changed and get a general overall inspection. The fuel sending unit in the tank had broken off and the replacement was almost $600 plus a couple hours of labor. I had feared that was the problem after doing some online research. But at least the truck will be in good shape when Doug & Kristi arrive next month. While we were in Las Vegas, we went to Staples to pick up a new all-in-one printer. 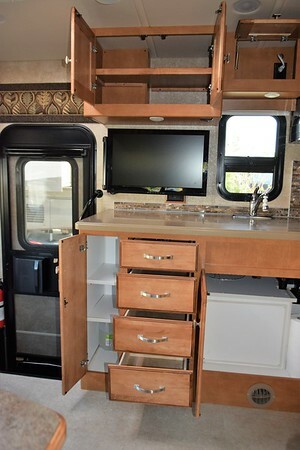 Our current model won't fit in any of the cabinets, so we have to downsize, which looks to be a recurring theme as we transition to the motorhome. Linda also wanted to go to IKEA to get some ideas. We had never been to an IKEA, so it was quite the experience. Standing inside the door looking at a map of how to get through it and the various shortcuts to get from department to department, a fellow name John appeared out of nowhere and explained how it all worked. I have to say we were impressed by that type of customer service. We were there over an hour as Linda got ideas. 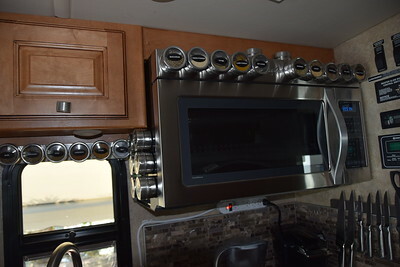 She picked up a couple of magnetic bars to hang in the kitchen, but we didn't see much else that would be suited to our new RV. Before heading back to Pahrump, we stopped and looked at a 2005 Jeep Liberty with 4WD to replace our current one. Unfortunately, though it drove great and seemed to be in good shape mechanically and on the interior, the sun-baked hood and roof looked awful. It hadn't been through detailing yet, but the best they would do without painting it would be to cover it up. We ran the numbers anyway, but we were $2,000 apart on making a deal including getting it painted. 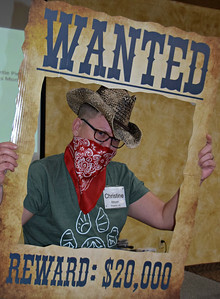 Back in Pahrump, it was too late to delve into getting too ambitious. We woke up at 5:00 a.m. Yes, even Linda. Too many things going through her mind as she tries to visualize where the "necessities" are going to go in the Winnebago. Today, we continued the massive effort to divide our belongings up into piles - "going in the motorhome", "going into storage to take to Florida", "going to Goodwill", and "going in the trash". 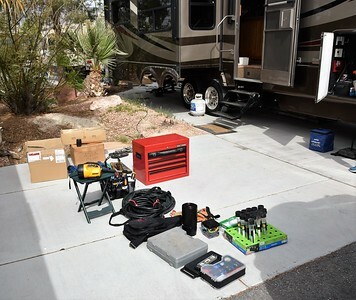 Fortunately, we have several items that we can donate to the new buyers as they are rig-specific or we won't need in the motorhome. The RV park allowed us to park in the empty site across the road for the day. Our biggest accomplishment for today was getting our clothes pared down and moved. 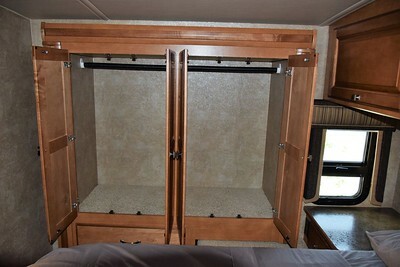 The wardrobe in the Aspect has good storage for hanging clothes, but the drawers are lacking. So, we had to transition some "drawer clothes" to hangers. And then I went to Walmart to get a bunch of storage bins. 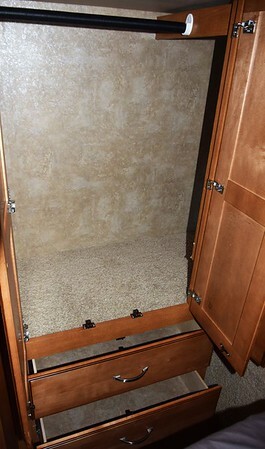 We continued to further cut down the clothes so we could get what we needed in the cabinets over the bed. 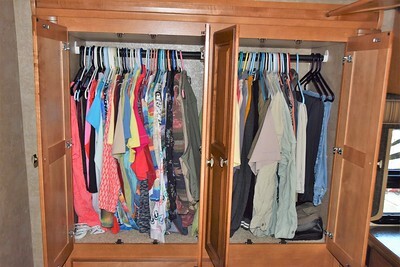 It does help keep similar clothes together, and we kept the bins small enough that we can pretty easily pull one down, get what we want, snap the lid back on and put it up. It's not the most convenient thing in the world, but it'll work. Linda works on an area, and then gets distracted. The bathroom and kitchen, especially the kitchen, are going to be tough. She has been putting off moving kitchen stuff and food. The decision-making makes this mentally challenging, and the fact that we've been spoiled with space for so many years increases the decision-making. Questions as simple as "Where do we put a trash can and a laundry basket for dirty clothes?" require some contemplation and creativity. 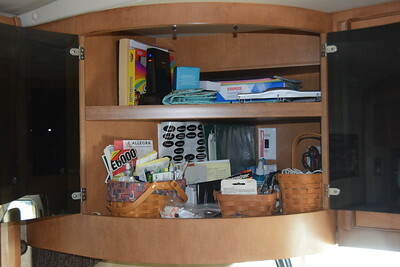 A trip to the storage unit and Goodwill helped make space in the fifth wheel to get around, but it's still a wreck. After a good day of work, we called it an early night. I think Linda was in bed at 8:30. It took me a little longer to get to bed, as I filed our taxes. Thank goodness I had prepared them last month and just needed to do a quick review and submit the returns electronically. We were wide awake at 4:00 a.m. this morning. Sheesh. The folks in the site behind us left early, so I moved the Aspect to that site as we had planned. However, the sites are separated by landscaping so carrying stuff through there wouldn't be easy. I went back to the office and we switched our transition spot to the site across the road where we parked yesterday. That will make things much easier. I started the day by dragging stuff out of the "basement" of the fifth wheel and out of our large, outdoor storage compartment in the front. And I unloaded the items we will need from the truck's storage compartments. Linda continued to start projects, get distracted, and move on to other projects. 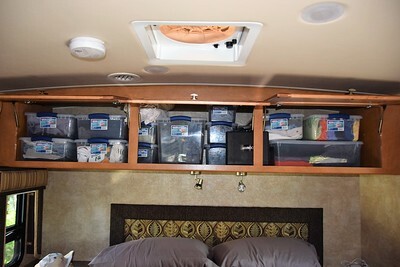 She helped me with the outside stuff, and we managed to get everything we needed into the "trunk" of the motorhome and the couple of other outside storage compartments. And we actually have room to spare. I'm just going to put up some hooks in the ceiling to get lightweight items like brooms and rig-cleaning brushes out of the way. Our rally supplies take up so much space, it made our basement look worse than it was. I'm quite pleased that we didn't have to fill the "trunk" to the top, and the weight shouldn't be too bad. It's really organized, although I threw my golf clubs and a couple of other things in before I took this photo, so it doesn't look as organized as it is. 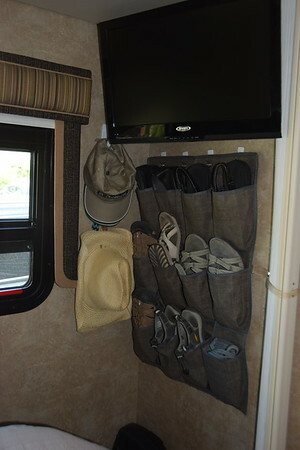 Linda put hooks up above the opening as it was a perfect place to hang our fly-fishing rods. And she put a hook up on the other door for our firewood carrier and our collapsible trash can. I've got my grill, air compressor, and tools situated so they are convenient. We knocked the tools down from a hundred pound Craftsman tool box to about twenty pounds in a small tool bag. I'll take more photos later when I hang some items and re-organize one more time. We were even able to get all our backpacks in there - we have six (two backpacking backpacks for overnighters, two Camelback backpacks for longer day hikes, a lighter weight backpack for shorter day hikes, and a backpack filled with fishing gear). Five of those six had been stored in our bedroom cabinets, so at least we don't have to find a space inside for them. And I'm really looking forward to getting to use all of them more in the coming months and years. We try to store the heavier items down low, but there is no good liquor cabinet. She'll figure it out. We worked our tails off again today, and we made good progress, although it doesn't look like it when you step inside the fifth wheel. We've got bins strewn about, but at least most of the cabinets and closets are empty. Linda made a slow-cooker soup in her Instant Pot while we worked, and after we ate dinner and she was cleaning up, she got emotional. Tears started flowing, and I'm sure it won't be the last time .... for either of us. We've lived in this RV for thirteen years, six years longer than any other place we've ever lived since we've been married. We've spent the best years of our lives in this rig, and we've really made it our home. Giving it up will be one of the hardest things we've ever done, much harder than selling any of the houses we owned. Certainly, we haven't made this decision without a lot of thought, and we've made the decision for a variety of reasons which will expand our horizons, and we have to keep that in mind. 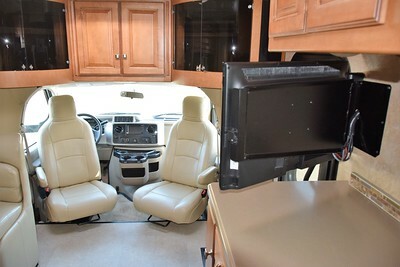 This transition is very similar to our transition from a dream house in Louisville into the fifth wheel way back in 2005. There are difficulties and emotions and second thoughts, although I didn't cry over any house like I'm crying right now as I write this, and will cry again when the new owners pull away. But this too shall pass, and we are happy it's going to members of our RV-Dreams Family who we will keep in touch with and help along the way. It will be worth it to see them happily enjoying what we have enjoyed thus far, and we are looking forward to creating more wonderful years of memories in the new motorhome. 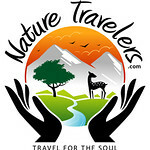 It's hard to fathom we will love the motorhome as much as our Cambridge, but that doesn't mean we can't have comparable and possibly even better experiences traveling and exploring our natural world. So here goes. 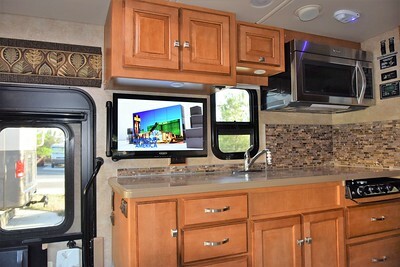 Our photo tour of our new-to-us 2015 Winnebago Aspect 27K (28 feet, 10 inches long and 10 feet, 4 inches tall). Exterior views in its temporary site here at Nevada Treasure RV Resort. Exterior compartments on the driver's side. From front to back, between the axles, we have the Onan 4000-watt generator. Then the propane tank (18 gallons - equal to our two 40lb cylinders on the fifth wheel). 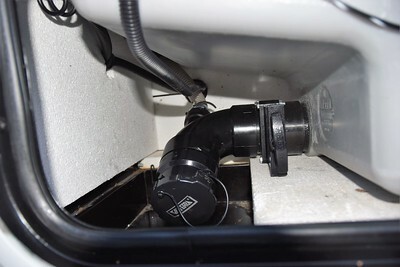 Next, in a small compartment that, inexplicably, can only be accessed with a key, is our sewer outlet and a portion of the black tank with TrueLevel exterior sensors. In the close-up in the photo below, you can see where the hose from the gray tank comes in through the wall and joins the three-inch PVC pipe. 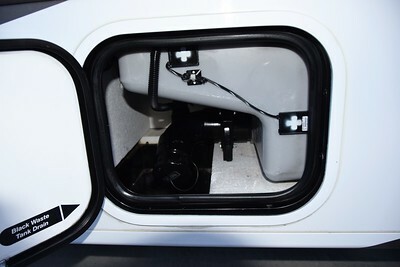 In the large compartment behind the rear axle is the gray tank with the TrueLevel sensors. And, from this angle, you can see the gray tank is drained using a macerator pump which sends the gray water up and around the black tank where it connects to the sewer outlet pipe. It's a strange way of setting up the tanks to avoid having two separate sewer outlets. 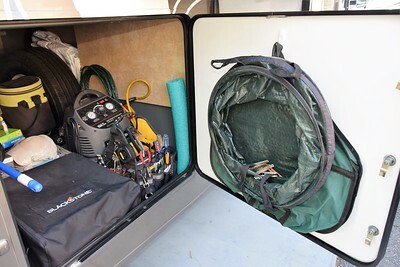 The next small compartment is for the 30-amp electrical connection and cord, and the last one is where the sewer hose is currently stored. 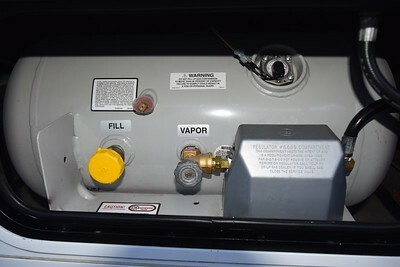 On the other side of the rig, the passenger side, we have the furnace exhaust, the Atwood water heater access panel, the refrigerator access panel, a couple of 120-volt outlets, a 12-volt outlet, a cable connection, and three compartments between the axles. 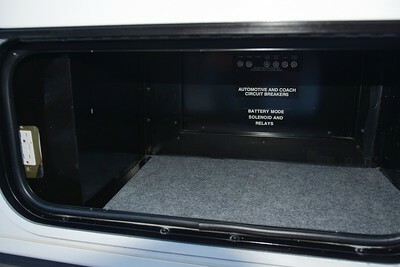 From front to back, the first compartment has some decent storage, but it is also has breakers and the access to the 1000-watt inverter (on the left behind the black metal panel. The breaker box and fuse box is at the bottom of the kitchen counter inside. Next is the battery compartment with two house batteries on a slide tray. And then we have access to the hydraulic system for the jacks. 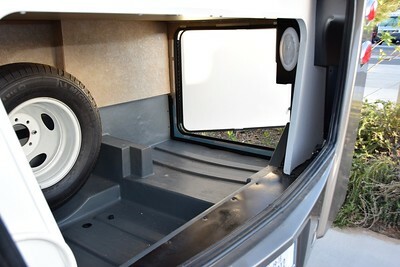 Behind the rear axle is a nice storage compartment under the bedroom slide (contains the wardrobe/closet) and side access to the large "trunk". In the back, we have the large trunk area which is a huge reason we went with this model. View from the side access. The hose in the upper left corner is for the gravity fill for the fresh water tank. 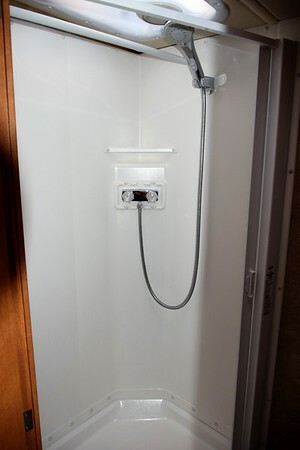 The outdoor shower is on the left and next to it is the city water connection and the switch for "normal" water usage or "power fill" for the fresh water tank. Tucked in the corner next to the shower and water hook-up are a switch to turn the water pump on/off (it can be turned on/off inside as well), the button to start the macerator to drain the gray tank, a couple of 120-volt outlets, a connection for a portable satellite dish, and a cable connection. 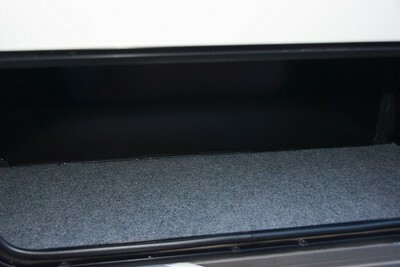 Oh, and there is the optional exterior entertainment system mounted in the passenger side corner of the trunk. And I just realized I didn't take a full shot of the rear of the coach, so I'll have to do that to show the trunk closed and the camera at the top center. Note, there is no ladder on this rig, so we'll have to decide on what we want to do to access the roof. On the roof is a King Jack TV antenna for over-the-air broadcasts, a King Dome in-motion satellite dish (don't know if it works), and the usual vents. There is room for 2 - 4 solar panels. I have to get my ladder out and get up there to get some photos. 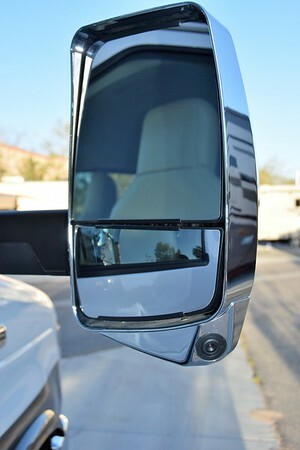 Before we go inside, here is a picture of the very nice side mirrors which also have cameras. Whenever a turn signal is on, the view on the screen in the cab switches to that side mirror. Inside, we start in the front. Of course, I had to take a picture of the federal compliance labels on the driver's door which shows our Gross Vehicle Weight Rating, our Gross Axle Weight Ratings, the original tire sizes, rim sizes, and recommended tire inflation pressures. 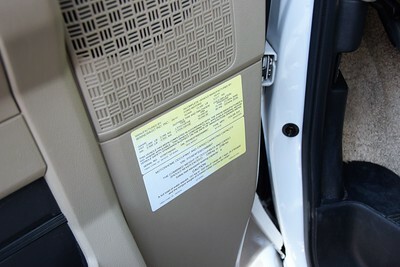 It's accompanied by the other required weight label that shows our Occupant & Cargo Carrying Capacity. 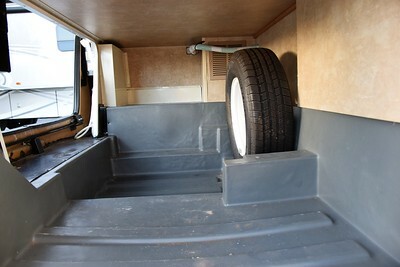 Here's a view of the cab and storage area over the cab. While driving, we were impressed with the cup holders and various little storage nooks in the console. 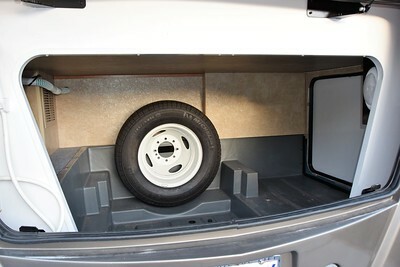 One of the great things is that the cab chairs swivel to provide extra seating when parked. 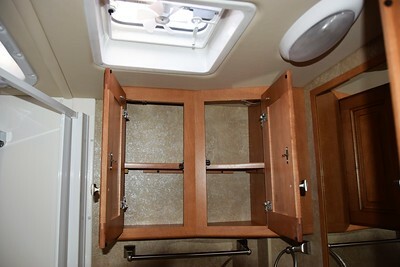 View with center cabinets open, and you can see the sunroof in the ceiling. The black panels on either side of the glass door cabinets are speakers. 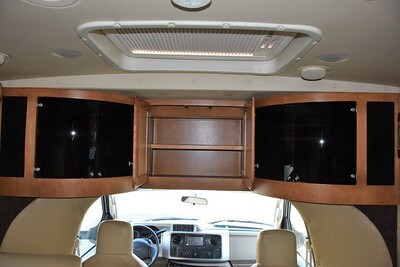 The cabinet with the black glass on the right contains a CD/DVD player and the video selection system. 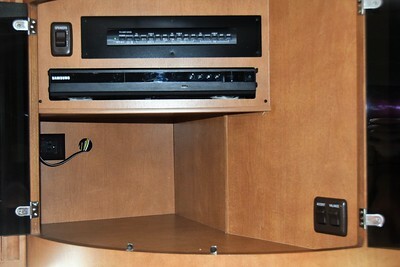 The opposite cabinet has satellite connections where a satellite receiver/DVR would go. 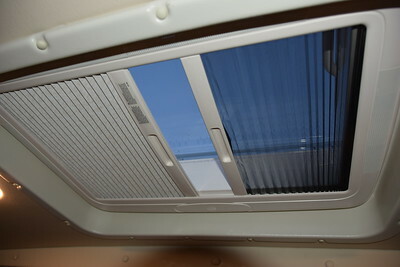 The sunroof is manual and can be opened to different levels. You can let the sun shine in without shade or you can use either of the two types of shades. 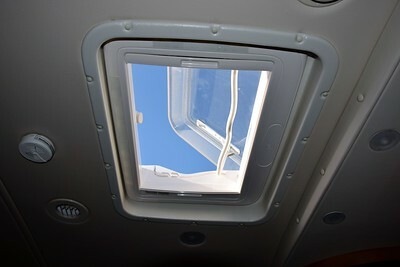 I like the sunroof although it does take up space that could be used for a solar panel. 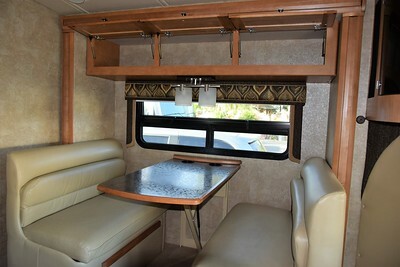 Here are a couple of views with the dinette slide in. 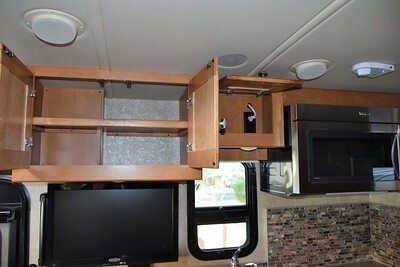 Here's the dinette with the storage above. 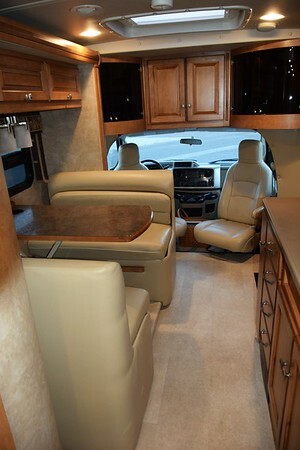 The dinette converts into a bed and there is a lot of storage under the bench seats. However, we will be removing the dinette and putting in reclining theater seating from our friends at Lambright Comfort Chairs. Though we could use the storage space, comfort takes precedence over the storage and extra bed. 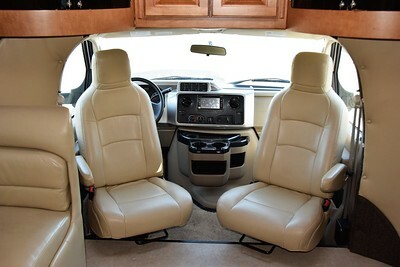 So, imagine something like the seating below in place of the dinette. That's what our friends Bob & Karen did in their same model Aspect. 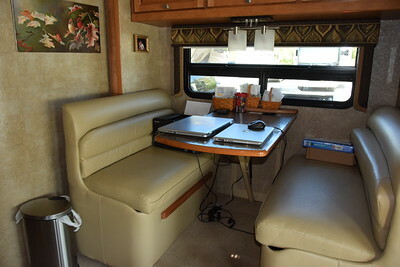 With the dinette slide out, there is a lot of room in the living area/kitchen. And there is pretty good counter space, except you can't store anything like a Keurig or Instant Pot on the counter in front of the TV. So, we are considering moving the TV to above the door. We'll see. 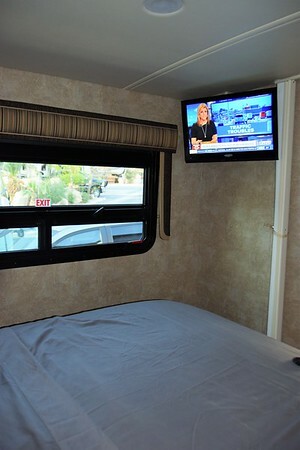 The TV does swing out, so you can watch it from the cab seats. 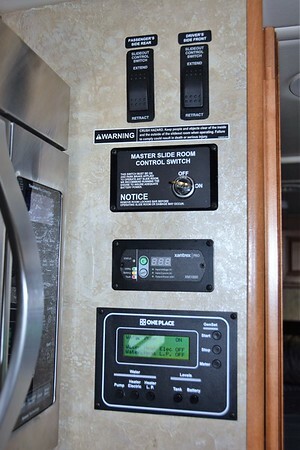 On the end of the cabinet in the photo above, there are various light switches as you come in the door, and in the lower left corner is the control panel for the leveling system and controls for the awning. It was far too windy today to put the awning out. Below those is the battery disconnect switch. Okay, back to the kitchen, Linda's biggest concern. 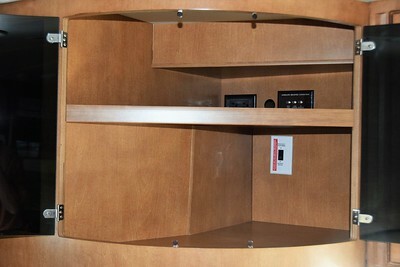 Here's a look at the cabinet and drawer storage in the kitchen. A big problem is that the water heater is under the sink taking up significant room. The in-house water filtration is also under the sink. 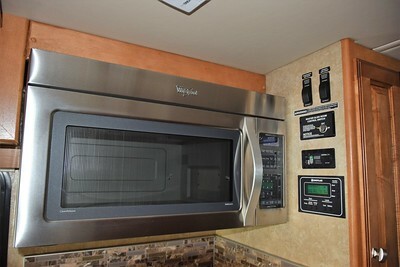 Their is no gas oven, but there is a huge Whirlpool microwave/convection oven. 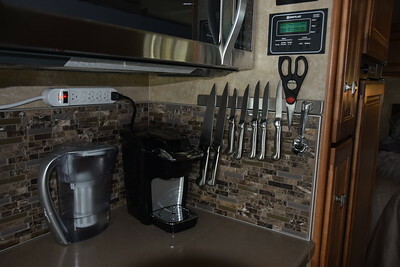 Next to the stove is the pantry - paltry by Linda's standards (and in comparison to the fifth wheel), but not too bad. 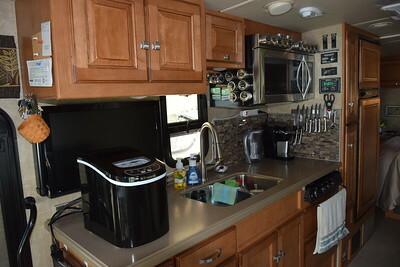 And next to the pantry is the RV propane/electric refrigerator (Norcold). 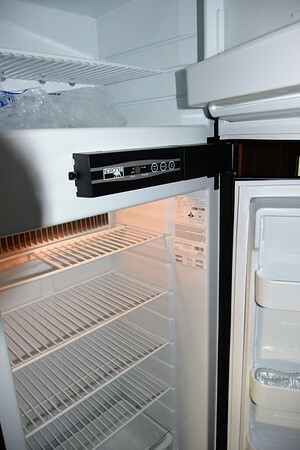 An option in these Aspect models is to forgo the pantry and get a bigger, four-dour refrigerator. It's a tough choice, but one we didn't have to make, and Linda prefers having the pantry. 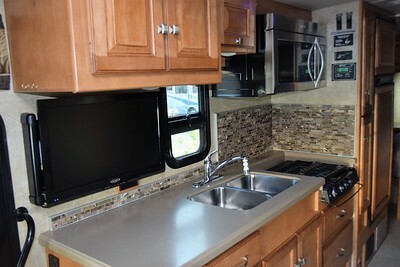 We will definitely miss the refrigerator and pantry in the fifth wheel. The slideouts are Lippert In-Wall Schwintek Slide-Outs. Fortunately for us, there are few reports of problems with this system on small slideouts. Unfortunately, for those with much larger slideouts, this system has a bad reputation. In this rig, they seem to be working just fine other than being a little noisy when going in and out, but there is no weight in them yet. What causes me some concern is that the prior owner highlighted the information in the owners manual about manual operation. I hope that's an issue that has been corrected, assuming there was a problem. The King Jack rooftop TV antenna control is on the ceiling above the microwave. 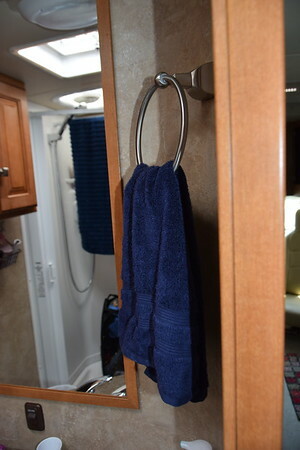 This antenna is becoming standard in many RVs. It's not the most durable over-the-air antenna, but it is quite easy to use as blue lights light up as you turn it telling you when you have the best signal. 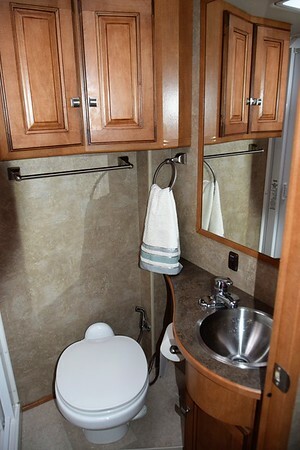 The small bathroom is across the aisle from the pantry and refrigerator. 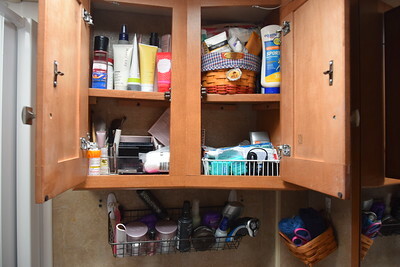 There is a tiny bit of storage under the sink and a decent wall cabinet. The shower is, of course small, but at least it is somewhat in a corner making it a little larger than other Class Cs of this size. 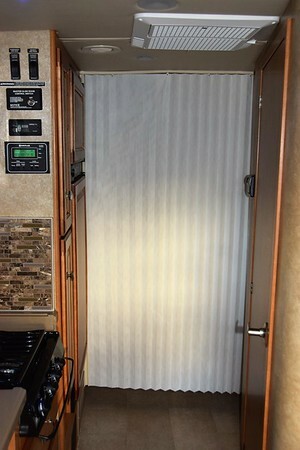 They call the "door" a "retractable, self-cleaning shower door". It's pretty flimsy, but saves on space and weight. Now, I'm only 5'8" and I barely fit in the shower. This unit is definitely more suitable for us short people. Tall folks would have trouble in the cab and pretty much everywhere else. I will say that the lighting in the bathroom is very good. Moving to the bedroom. Linda hasn't put her special touches on the decorating yet, but here is the queen-size bed. You can walk around on both sides, but it is tight on the right side. Still, it's not in a corner. The prior owners opted for the optional Nouveau™ by Ideal Rest® mattress upgrade. The comfort level is digitally controlled on each side much like a Sleep Number. Personally, I'd rather it had a regular mattress, but we'll give it a try. 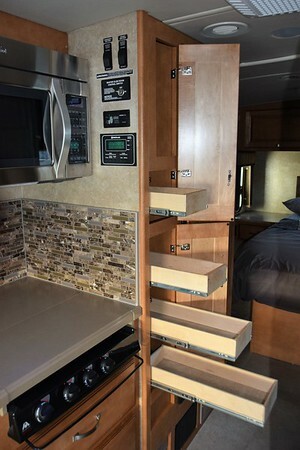 Storage above the bed and nightstand drawers on the sides. 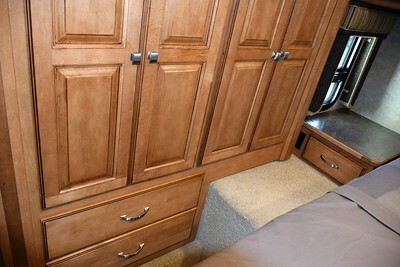 In the slideout is the nice sized wardrobe/closet with a couple of drawers. Some clothes are going to Goodwill, but I think we can make this work. There is a Fantastic Fan, an emergency exit window, and a small TV. 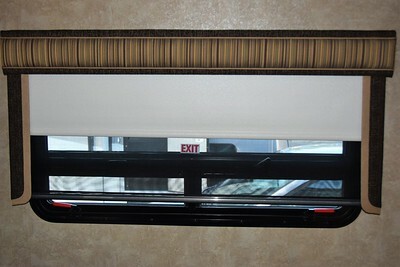 All of the windows in the coach have MCD roller shades - solar and blackout. 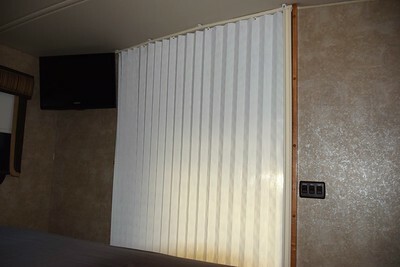 Though we won't use it, there is a pleated door to allow some privacy. 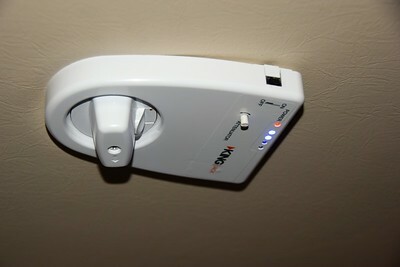 In the photo above you can see the air conditioner. It's a Coleman-Mach 15,000 BTU with a heat pump. 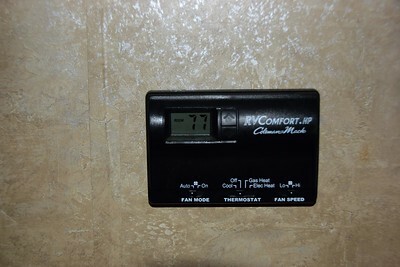 And the Coleman-Mach RV Comfort thermostat controls it and the Suburban 30,000 BTU furnace. Well, that's about it. The coach is in great shape, and considering the full body paint and other upgrades and options the prior owner purchased, I think we did pretty good. Let us know if you have any questions or want photos of items or areas I didn't include. We were up early and ready to complete our trip back to Pahrump. It took a couple of hours, but it eventually cooled down enough to at least cover up in a sheet. I took a quick walk around the Burro Creek Campground and wished we could stay longer. When I returned to the campsite, Linda was outside and simply said "I'm ready". Okay, so in the fifth wheel, Linda has a routine when we leave a campground. It requires moving several items, turning furniture so the slides can come in, and a few other steps. She has it down, and it only takes her about twenty minutes. But with the Class C, no furniture has to be moved, and she just will have to make sure there is nothing obstructing the slideouts. Of course, we have nothing in the rig yet, so this morning it took about five minutes to get ready to leave. With the slides in, we pushed the button for the leveling jacks and got a "travel mode" light which indicates they are properly retracted. But there is a big, bold warning in the manual that says it's still the owner's responsibility to do a visual check, which we did. I gave Linda the option, and she chose to drive. Since we didn't have a coffee maker, the first order of business was to find her some coffee. She pulled over at the first gas station/convenience store and handled it perfectly. I called Diesel Specialists in Vegas to see if our truck was ready, so we could pick it up on our way through. Unfortunately, the part they were waiting for didn't come in until late yesterday, so the truck wouldn't be ready until late this afternoon. So, we just headed on back to Pahrump. We stopped for fuel at a gas station I never would have attempted in the fifth wheel. While we were there, a Class A motorhome pulled in towing a three-axle cargo trailer. All of us at the gas station watched in amazement as the driver tried to make a sharp turn around the pumps and nearly hit a truck. Seeing he wasn't going to be able to make the turn, he backed up and eventually determined he wasn't going to be able to get gas there. It took some maneuvering, but he finally got out of the gas station and headed down the road to find another one. We were feeling quite smug in our smaller motorhome. 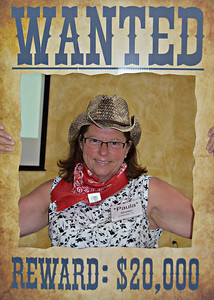 Linda got us out of there easily and we completed our trip arriving at Nevada Treasure RV Resort in the late morning. We pulled into the check-in lane and walked to the office not knowing exactly what we were going to say. Fortunately, Bill, the manager was there and we talked through our situation with him. He gave us lots of options. 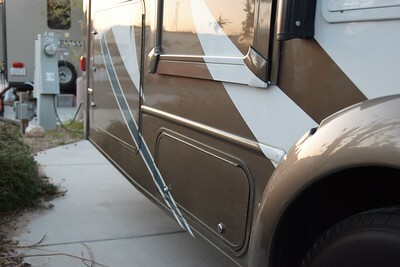 On Sunday, a spot will open up behind our fifth wheel to help us make the transition easy. In the meantime, we paid for a second site for the motorhome about eight sites away on the same row. Fortunately, we could use Passport America for two nights. 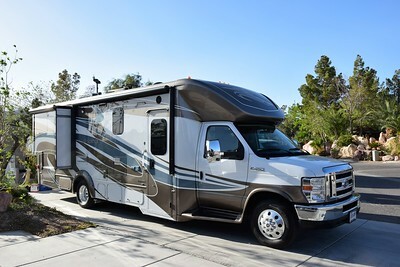 After we complete our transfer of stuff (pared down significantly), we'll put the truck and fifth wheel in their storage area ($50/month) until our buyers, Doug & Kristi, arrive in mid-May. 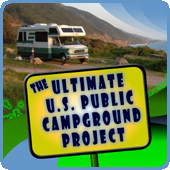 And we'll put the motorhome in our current site. 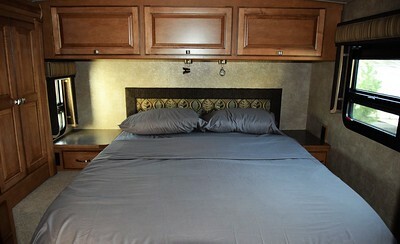 When Doung & Kristi arrive, we'll put the truck and fifth wheel on a site and have it ready for them. We'll then spend a couple of days going through everything with them to get them as comfortable as possible. We backed into the site and then met the neighbors who are here for the Spring Rally. Back at the fifth wheel, we just got something to eat and relaxed for a couple of hours. We'll get a storage unit here in Pahrump. We will put everything we use for rallies in the storage unit, and she will pack up bins of other stuff we want to keep and they will go in storage as well. Her vision is that we will come back here in the Fall, get a small cargo trailer and make a cross-country trip. We'll drop off rally stuff in Tennessee and then continue on to Florida to store the rest of our few bins at our rental house. 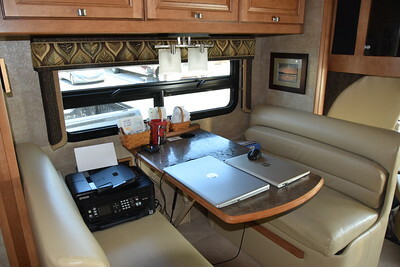 Moving forward, while we will do Boondocking Rallies and Reunion Rallies in the areas we travel - they don't require as much and we can have what little we need shipped in. 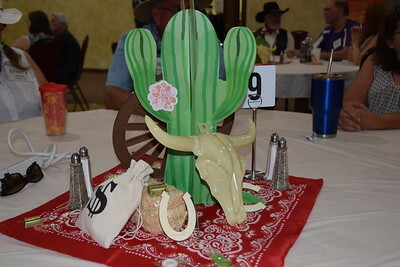 However, we will hold only one more Educational Rally in the west in 2019, and then all future Educational Rallies will be at River Plantation RV Resort in Sevierville, Tennessee. After we drop off our items in Florida and get our wills and living wills redone there, we'll head back west over the winter. We went to Walmart to pick up some storage bins, and then the process began. Linda was a bit overwhelmed when she started emptying cabinets. We have different approaches in our minds. 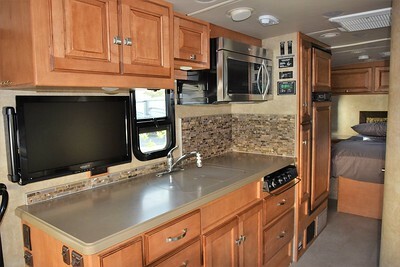 I want to take everything we absolutely have to have in the new RV and put it in. We can then see where we are and fill in and figure it out from there. 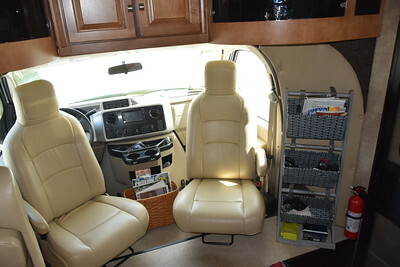 Linda wants to keep everything we need in the fifth wheel until the last minute and pack up the things she knows she wants to store or donate and move those items out first. 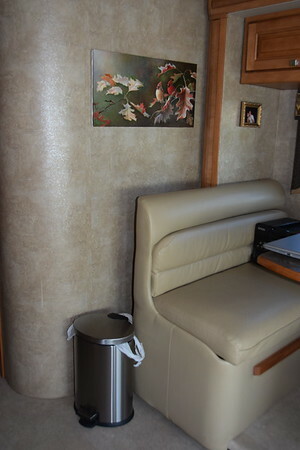 Then we can move the necessities on Sunday when the motorhome will be in a closer site. 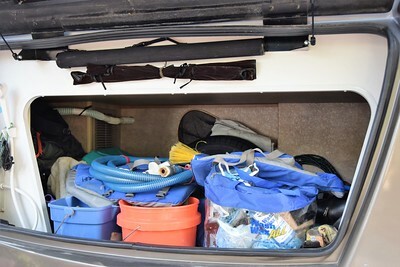 I went to the motorhome site and cleaned out the "trunk". The prior owner left several things in there, and the RV dealership assumed it was ours and didn't clean it out. 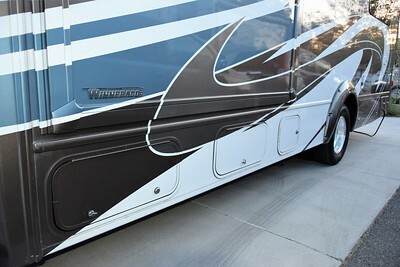 Then, I thought it would be a great time to completely photograph the Winnebago Aspect before we put anything in it. So, here is a separate entry with a comprehensive photo tour for those interested. Later, Leesa came over to help Linda pack up the stuff we won't need. By the end of the night, Linda had made great progress, and we had moved a few items into the Aspect. We were exhausted and the "house" is a wreck.